Games Workshop is at Adepticon 2017 this year (the event runs through this weekend so it’s technically still running). At the event Games Workshop teased some pretty big news which we’ve been covering. But on top of that, they also brought over multiple copies of Shadespire and were running demo games for the fans who come to Adepticon early Wednesday and stayed super late. I was in the room for the seminar and I was also lucky enough to get in a demo of the game. My “opponent” for the demo was none other than the talented author, web wizard and consummate professional Geek and Sundry’s Teri Litorco! And if that wasn’t cool enough, the fellow running our demo was none other than Warhammer TV‘s very own Eddie! 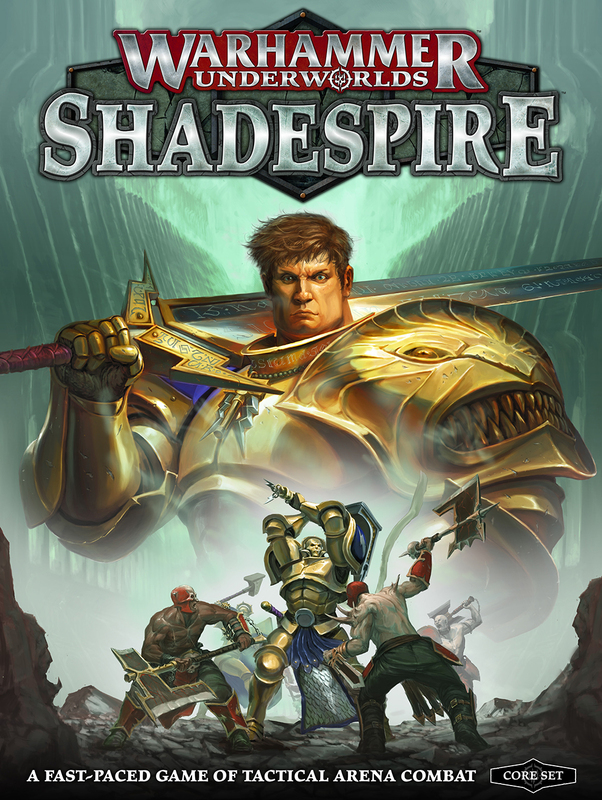 So let’s talk about Shadespire! 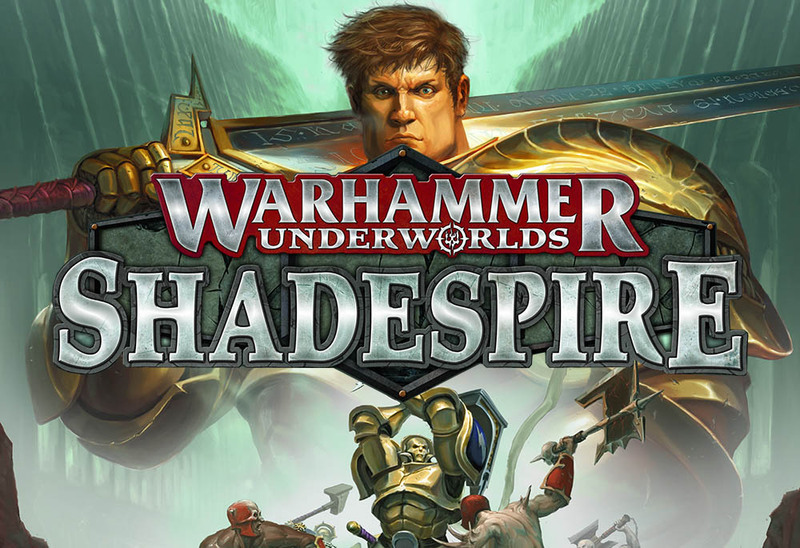 Warhammer Underworlds: Shadespire is billed as “A fast-paced game of tactical arena combat” and that’s a pretty accurate description – but there is a whole lot more going on. The game takes place on two boards, each player choses their board and determines how they want to setup there half-of the arena. There is an element of strategy in the setup of the board as you can shift the two sides around. For the demo we just played straight-up. The game also uses a couple of decks of cards per player. You’ve got your Warband deck, which you can customize and build to your liking, and then there is an objective deck. The objective deck is used to determine what objectives you are trying to complete. Whoever get the most objective points by the end of the match wins. 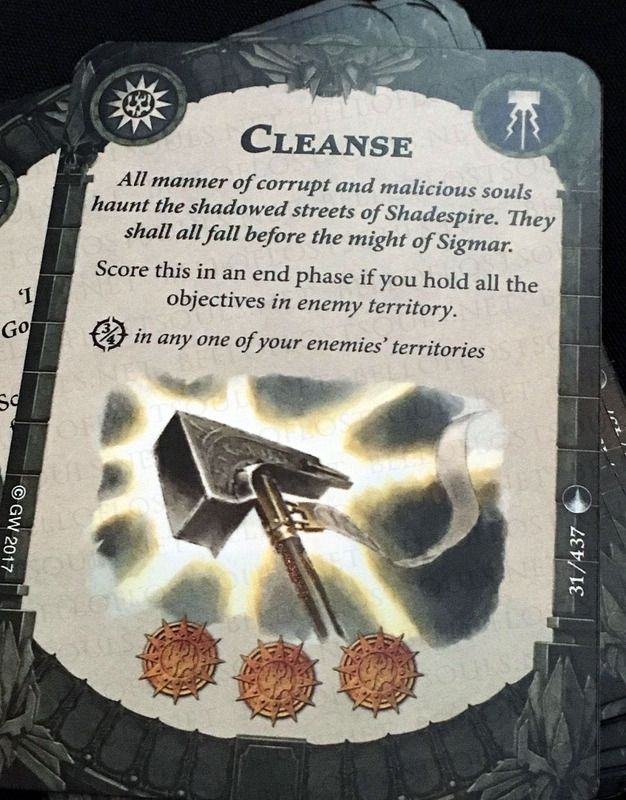 Cleanse in an objective card for the Stormcast Eternals – scoring this will net you 3 objective tokens. The game is supposed to be run as a “best-of-three” match game and it takes roughly 40 minutes to go through all 3 matches. So it’s FAST. Things tend to die pretty quickly, too! 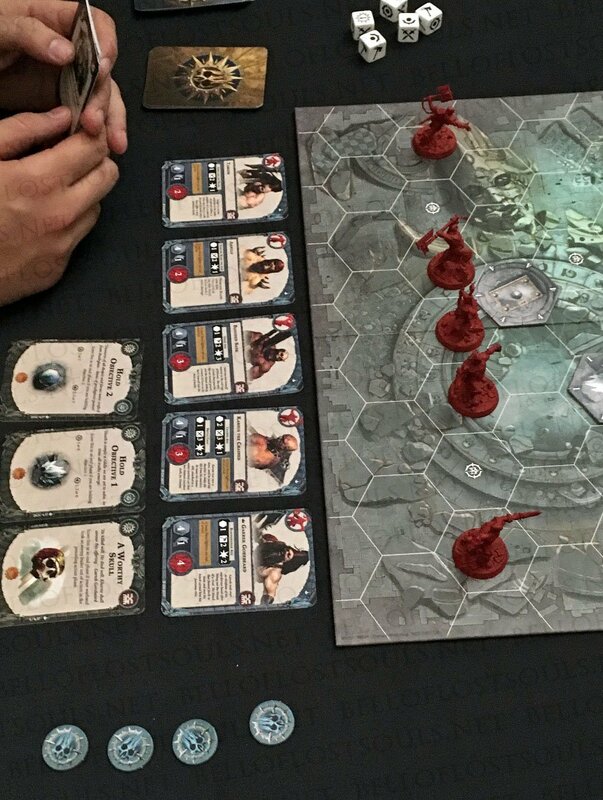 Eddie pointed out that our demo was the only one where no one died in the first turn. I’m chalking that up to Teri taking it easy on me due to the camera. The Bloodbound Warband ready to pounce! Each player brings more than a board and cards to the table – this is a miniatures combat game after-all! The Warbands are where the players can really customize their forces as well. The starter set looks to have two Warbands – the Stormcast and the Bloodbound. 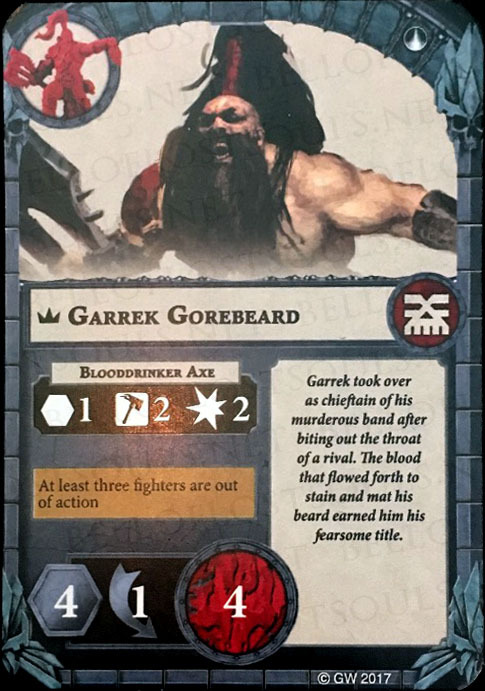 I don’t have details on if these are the only cards and models in the core set, but GW did confirm there are more planned Warbands on the way at the time of launch. Anyhow, the members of your Warband also determine some of the cards you can use to build your deck. There are neutral cards that anyone can use to create their decks as well. First, we have the portrait of the hero along with a picture of the model. The name of the Hero is below the portrait and the “Crown” is an indicator that he is the leader of the warband. Next up, the Weapon the character is wielding. The hex with a 1 is the range of the weapon (this weapon has a range of 1). The “Hammer” is the icon the type of result you need to score a success on an attack. The 2 is the number of dice you roll. And the 3 is the amount of damage a successful attack causes. So, the Sigmarite Broadsword has a range of 1, rolls 2 dice needing Warhammers, and causes 3 damage on a successful attack. The Bottom “Bar” shows the characters stats. 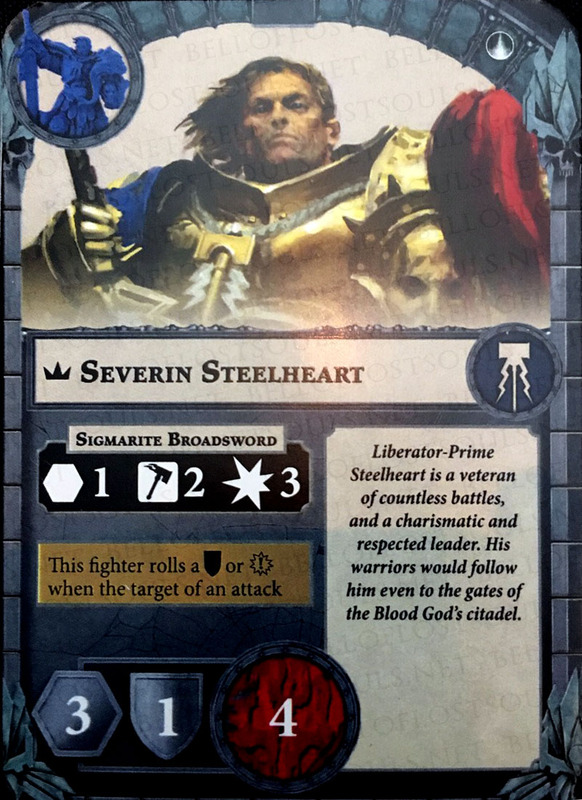 Steelheart has a move of 3, a defense of 1 die needing a shield and 4 health. Crossed Swords – this is another type of success result – weapon attacks need either a Warhammer or Crossed Swords. It’s one or the other. So if you need hammers and roll swords it’s a miss. The single “assist” – the is the side with an “ornate arc and a dot” – this dice counts as a success IF the target is adjacent to two (or more) opponents. The double “assist” – this is the side with a double “ornate arc and dot” – this counts as a success if the target is adjacent to three (or more) opponents. The Shield Icon is a block – The Stormcast rely on their armor so they have to roll a shield to count as a success. (Steelheart above rolls 1 die and needs a shield, vs the Bloodbound who need to roll a dodge). The “Curved Arrow” is a dodge. Most of the Bloodbound can only defend if they dodge. 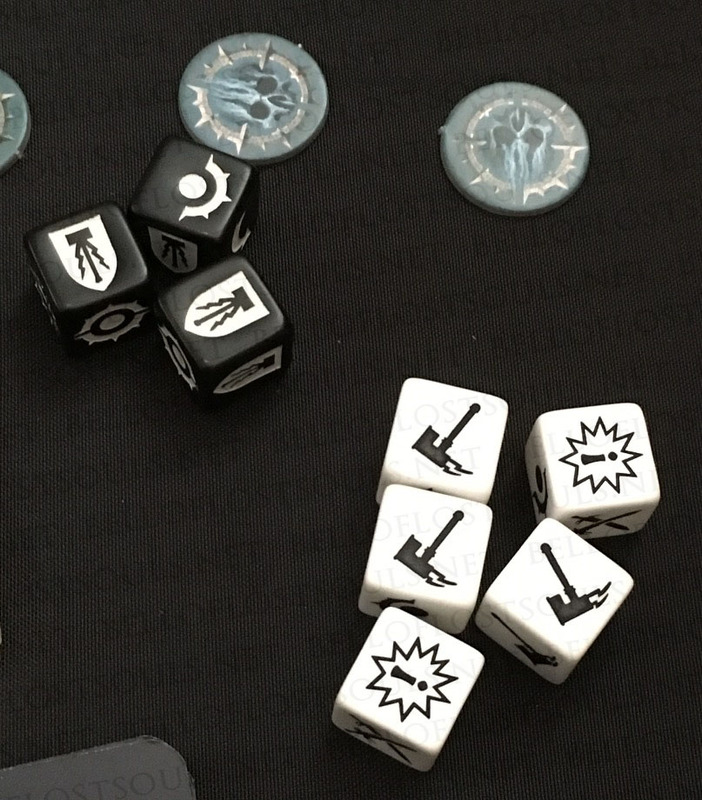 Stormcasts can count them as successes if they choose “Dodge” as their action for the turn. The single “assist” – counts as a success if the attacker is adjacent to two (or more) opponents. The double “assist” – counts as a success if the attacker is adjacent to three (or more) opponents. When you roll the dice you’re looking to compare the results of the attack vs defense die. If the defender can successfully “cancel” all the successes (or if the attacker just whiffs) then the attack misses. If the attacker manages to get even 1 success past the defense die, the defender takes the full damage of the attack. You do not add extra damage for more successes. If the attack does 3 damage, that means the defender takes only 3 damage for 1 success or more – not 3 damage per success. There is more to the game, but watch the video as Eddie explains how a typical round works. The game is really easy to pick-up and play. On top of that, it’s also really fast so it’s perfect for gaming on the go. Games Workshop has really designed this game from the ground-up to be a tournament game. They want you to be able to play it casually, competitively, on the go, or at your FLGS. They want to offer lots of tournament structure and support to go along with this game. It really seems like a good game for leagues and stores with limited play areas. This game is NOT Mordheim. It’s NOT Gorechosen 2. It’s NOT an AoS expansion. It’s a game from the “Core Studio” and not the “Specialist” side of the house. While there will be some cross-compatitablity, this is a stand alone game. The warbands are going to have their own unique characters who will probably have warscrolls for use in AoS at some point. But the idea is that you collect a warband, build a skirmish sized force, customize your deck, and choose a “board” to go with them. Then you go play! It’s not a Collectable Card Game (CCG), it’s closer to a Living Card Game (LCG) in that respect. Overall, I was pretty impressed with the models, the game play, and the fun I was having. I can see this game being a hit as long as folks try it out – and you SHOULD! If you’re looking for a fast, fun, easy-to-play game then Warhammer Underworlds: Shadespire has you covered. Shadespire is out later this year!